Spark plugs play a key role in starting your gas-powered car: They provide a hot spark that ignites the air-and-fuel mixture in the cylinder of an engine. But there are several signs you might have a bad spark plug. 1. Your check engine light is on or flashing. Bad spark plugs can cause your engine to misfire. The engine’s computer uses sensors to detect these misfires and will create a code that turns on the check engine light. A flashing check engine light indicates the misfire is severe enough to cause damage to your catalytic converter. If your check engine light is flashing, get to a mechanic quickly to avoid damage — a catalytic converter is very expensive to replace. 2. Your engine is running rough, or you sense excessive vibration. A faulty spark plug will not ignite the air-and-fuel mixture properly. This will cause a misfire that will make your engine run rough. When an engine is not firing on all cylinders, it can get off balance and result in excessive vibration. In this situation, you will feel the car shaking primarily while idling in gear. 3. Your car is taking longer to accelerate. Spark plugs are a maintenance item, and they will wear out under normal conditions. Typically, all the spark plugs will wear at the same rate, eventually leading to a lack of acceleration power. This happens because each plug is just slightly underperforming and causing an overall reduction of power in the engine. 4. You’re getting worse fuel economy. When a spark plug is not igniting the air-and-fuel mixture properly, your engine will have to work harder to produce the same power. You’ll need to use more throttle to get up to speed — which means using more fuel. If you notice a sharp decline in your mileage per gallon, faulty spark plugs could be the reason. 5. our car is taking longer to start. Bad spark plugs can cause your engine to require more cranking revolutions in order to start. A weak spark will not ignite the fuel quickly, and thus you’ll need to crank your engine longer for combustion to begin. 6. You hear a ticking noise under the hood. On some engines, spark plugs are more prone to coming loose or cracking. When this happens, the pressure from the cylinder is released into the atmosphere and will cause a ticking or rattling noise while running. 7. You notice a foul smell from the exhaust. Any time there is incomplete combustion, raw fuel can enter the exhaust and cause a smell similar to sulfur or rotten eggs. This can indicate a problem with a spark plug not working properly. For most (but not all) vehicles, you will have one spark plug per cylinder in your engine. So, if you have a four-cylinder engine, you’ll likely have four spark plugs. Like most everything on your car, they involve routine maintenance, and there’s a chance they could fail. 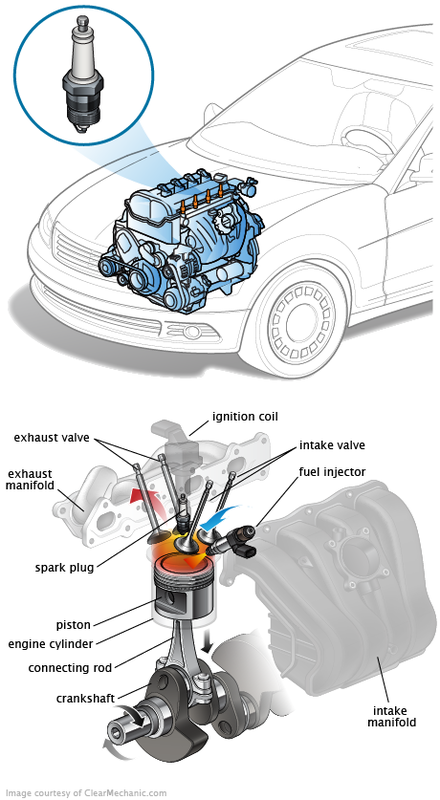 Spark plugs are threaded into the cylinder head in the engine so that they protrude into the combustion chamber. The spark plug is made of a center electrode, a porcelain insulator, a threaded metal casing and a side or ground electrode. High voltage is sent from the ignition coil through a heavily insulated wire to the center electrode. The current jumps the gap between the center and ground electrode and creates a spark. This spark occurs at the top-center of the power stroke. The result is an explosion in the cylinder that sends the piston back down and turns the crankshaft. Spark plugs need to be replaced at specific intervals. Consult your owner’s manual for maintenance recommendations. For most cars, there is a mileage and time interval. If you’re not sure about the age or condition of your spark plugs, you’ll need to remove them for further inspection. Measuring the gap between the electrodes will give you a good indication as to whether the plugs need to be replaced. The recommended spark plug gap will be in the owner's manual or on a sticker under the hood. You can buy a gap measuring tool at most auto parts stores for a few dollars. The cost of replacing spark plugs can vary, as can the work involved. On many newer vehicles, it can be difficult to access the spark plugs, which means a tough do-it-yourself project or higher labor costs. Some vehicles use two spark plugs per cylinder, which will also increase the cost of replacement. If you feel comfortable changing your own spark plugs, make sure to do it when the engine is off and cold. Be sure to replace the plugs with manufacturer-recommended parts. Before installing any spark plug, be sure to take notice of its length. Installing a longer spark plug can cause serious engine damage. Use a torque wrench when installing spark plugs, especially ones with an aluminum cylinder head. Over-torquing can strip out the threads in the head and require extensive work to repair. Use an anti-seize compound on the plug threads before you install new spark plugs. This will ensure an easy replacement next time. When replacing spark plugs, check the condition of the spark plug wires. They often need to be replaced around the same time as the spark plugs. Be careful, as they can be fragile. The color of the electrodes can tell you how your engine is running. A white electrode indicates the engine is running hot or lean — meaning there’s too much air in the fuel mixture. A black electrode indicates a rich condition — meaning not enough air in the fuel mixture. A heavy black residue means oil is entering the combustion chamber. A wet spark plug indicates fuel is not being ignited. How to change spark plugs. I do i remove the rear spark plugs on a 2006 kia sedona or does it even have any?? can any one help?